Whereas an individual hurricane event cannot be attributed to climate change, it can serve to illustrate the consequences for ecosystem services if the intensity and/or frequency of such events were to increase in the future. 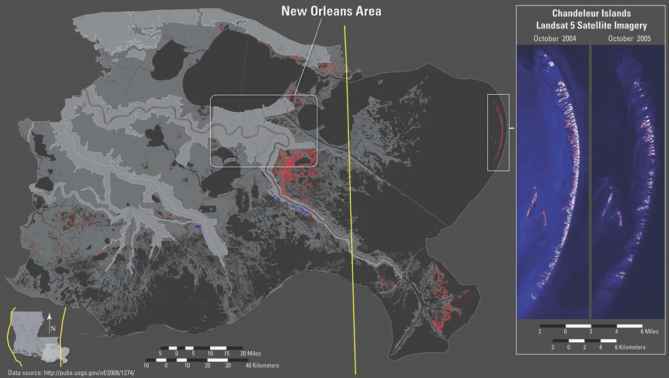 One result of Hurricane Katrina, which made landfall in coastal Louisiana on 29th August 2005, was the loss of 388 km2 of coastal wetlands, levees and islands that flank New Orleans in the Mississippi River deltaic plain (Barras, 2006) (Figure 6.7). (Hurricane Rita, which struck in September 2005, had relatively minor effects on this part of the Louisiana coast which are included in this estimate.) The Chandeleur Islands, which lie south-east of the city, were reduced to roughly half of their former extent as a direct result of Hurricane Katrina. Collectively, these natural systems serve as the first line of defence against storm surge in this highly populated region. While some habitat recovery is expected, it is likely to be minimal compared to the scale of the losses. The Chandeleur Islands serve as an important wintering ground for migratory waterfowl and neo-tropical birds; a large population of North American redhead ducks, for example, feed on the rhizomes of sheltered sea grasses leeward of the Chandeleur Islands (Michot, 2000). Historically the region has ranked second only to Alaska in U.S. commercial fisheries production, and this high productivity has been attributed to the extent of coastal marshes and sheltered estuaries of the Mississippi River delta. Over 1800 people lost their lives (Graumann et al., 2005) during Hurricane Katrina and the economic losses totalled more than US$100 billion (NOAA, 2007). Roughly 300,000 homes and over 1,000 historical and cultural sites were destroyed along the Louisiana and Mississippi coasts (the loss of oil production and refinery capacity helped to raise global oil prices in the short term). Post-Katrina, some major changes to the delta's management are being advocated, most notably abandonment of the "bird-foot delta" where artificial levees channel valuable sediments into deep water (EFGC, 2006; NRC, 2006). The aim is to restore large-scale delta building processes and hence sustain the ecosystem services in the long term. Hurricane Katrina is further discussed in Box 7.4 (Chapter 7) and Chapter 14. Climate change is expected to have impacts on agriculture and, to a lesser extent, on forestry, although non-climatic factors, such as technological development and management practices can be more significant (Easterling, 2003). Climate variability and change also impacts fisheries in coastal and estuarine waters (Daufresne et al., 2003; Genner et al., 2004), although non-climatic factors, such as overfishing and habitat loss and degradation, are already responsible for reducing fish stocks. Globally an increased agricultural production potential due to climate change and CO2 fertilisation should in principle add to food security, but the impacts on the coastal areas may differ regionally and locally. For example, in Europe, climate-related increases in crop yields are expected in the north, while the largest reductions are expected in the Mediterranean, the southwest Balkans and southern Russia (Maracchi et al., 2005). Temperature increases can shorten growing cycles, e.g., those of cotton and mango on the north coast of Peru during the El Niño (see Chapter 13, Section 13.2.2). More frequent extreme climate events during specific crop development stages, together with higher rainfall intensity and longer dry spells, may impact negatively on crop yields (Olesen et al., 2006). Cyclone landfalls causing floods and destruction have negative impacts on coastal areas, e.g., on coconuts in India (see Chapter 5, Section 5.4.4), or on sugar cane and bananas in Queensland (Cyclone Larry in March 2006). Rising sea level has negative impacts on coastal agriculture. Detailed modelling of inundation implies significant changes to the number of rice crops possible in the Mekong delta under 20-40 cm of relative sea-level rise (Wassmann et al., 2004). Rising sea level potentially threatens inundation and soil salinisation of palm oil and coconuts in Benin and Côte d'Ivoire (see Chapter 9, Section 9.4.6) and mangoes, cashew nuts and coconuts in Kenya (Republic of Kenya, 2002). Coastal forestry is little studied, but forests are easily affected by climatic perturbations, and severe storms can cause extensive losses, e.g., Hurricane Katrina. Plantation forests (mainly P. radiata) on the east coast of North Island, New Zealand, are likely to experience growth reductions under projected rainfall decreases (Ministry for the Environment, 2001). Increasing salinity and greater frequency of flooding due to sea-level rise reduces the ability of trees to generate, including mangroves which will also experience other changes (Section 6.4.1.4) (IUCN, 2003). (Section 6.4.2.4). The linkage between temperature changes and HABs is still not robust, and the extent to which coastal eutrophication will be affected by future climate variability will vary with local physical environmental conditions and current eutrophication status (Justic et al., 2005). Ocean acidification is a concern, but impacts are uncertain (Royal Society, 2005). Climate change also has implications for mariculture but again these are not well understood. Climate change and sea-level rise affect coastal settlements and infrastructure in several ways (Table 6.4). Sea-level rise raises extreme water levels with possible increases in storm intensity portending additional climate impacts on many coastal areas (Box 6.2), while saltwater intrusion may threaten water supplies. The degradation of natural coastal systems due to climate change, such as wetlands, beaches and barrier islands (Section 6.4.1.1), removes the natural defences of coastal communities against extreme water levels during storms (Box 6.5). Rapid population growth, urban sprawl, growing demand for waterfront properties, and coastal resort development have additional deleterious effects on protective coastal ecosystems. Much of the coast of many European and East Asian countries have defences against flooding and erosion, e.g., the Netherlands (Jonkman et al., 2005) and Japan (Chapter 10, Section 10.5.3), reflecting a strong tradition of coastal defence. 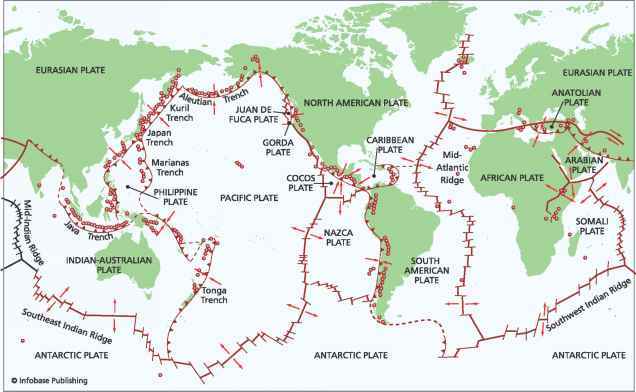 In particular, many coastal cities are heavily dependent upon artificial coastal defences, e.g., Tokyo, Shanghai, Hamburg, Rotterdam and London. These urban systems are vulnerable to low-probability extreme events above defence standards and to systemic failures (domino effects), e.g., the ports, roads and railways along the US Gulf and Atlantic coasts are especially vulnerable to coastal flooding (see Chapter 14, Section 14.2.6). Where these cities are subsiding, there are additional risks of extreme water levels overtopping flood defences, e.g., New Orleans during Hurricane Katrina (Box 6.4). Climate change and sea-level rise will exacerbate flood risk. Hence, many coastal cities require upgraded design criteria for flood embankments and barrages (e.g., the Thames barrier in London, the Delta works in the Netherlands, Shanghai's defences, and planned protection for Venice) (Fletcher and Spencer, 2005) (see Box 6.2 and Section 6.6). There is now a better understanding of flooding as a natural hazard, and how climate change and other factors are likely to influence coastal flooding in the future (Hunt, 2002). However, the prediction of precise locations for increased flood risk resulting from climate change is difficult, as flood risk dynamics have multiple social, technical and environmental drivers (Few et al., 2004b). The population exposed to flooding by storm surges will increase over the 21st century (Table 6.5). Asia dominates the global exposure with its large coastal population: Bangladesh, China, Japan, Vietnam and Thailand having serious coastal flooding problems (see Section 6.6.2; Chapter 10, Section 10.4.3.1; Mimura, 2001). Africa is also likely to see a substantially increased exposure, with East Africa (e.g., Mozambique) having particular problems due to the combination of tropical storm landfalls and large projected population growth in addition to sea-level rise (Nicholls, 2006). Table 6.5. Estimates of the population (in millions) of the coastal flood plain* in 1990 and the 2080s (following Nicholls, 2004). Assumes uniform population growth; net coastward migration could substantially increase these numbers.